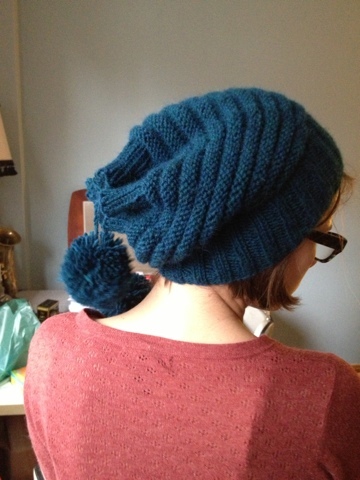 First Holiday Knitting Project Complete! The holidays can be a stressful time for knitters. Many people find themselves inundated with requests from friends and family for hand-knit gifts; others get themselves in a pickle by underestimating the time it takes to complete all the gifts they want to give! So, my rule is generally one to two hand-knit projects a season. Last year Eli got socks and the cousins got Candy Cane Ponies (one also got a coffee cozy). The year before Aunt Meg got the prototype for the Tinsel & Garlands Mitts. So this year I decided to make a hat for our dogwalker, and another project that must, at this moment, remain top-secret. I'm a little behind, but still confident I can finish on time(-ish). This is the I <3 Pom Poms pattern, and boy do I <3 pompoms! I've been wanting to knit it for a very long time. It knit up very quickly and is just so damn cute! The yarn is Berroco Ultra Alpaca. I bought it a few years ago at the Lambe Shoppe in Denver. 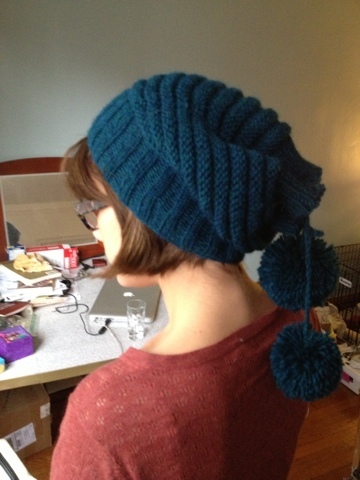 I used almost the entire skein for the hat and cracked into my second one just for the pompoms. 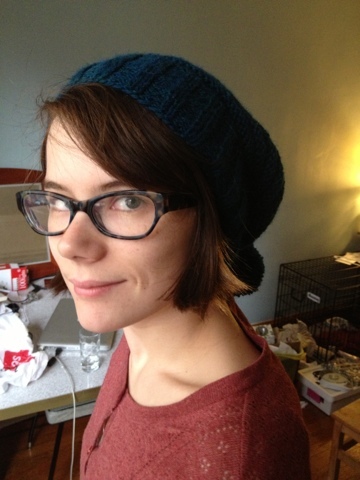 I will definitely make this hat again! My other X-mas knit will probably be posted in the New Year. But if you're feeling extra nosy it is listed as one of my projects on Ravelry.